We care for 300 children and youth who live in physical, emotional and material poverty, and help about 200 families with food and health care. The Niños de Maria for children aged 3-4. 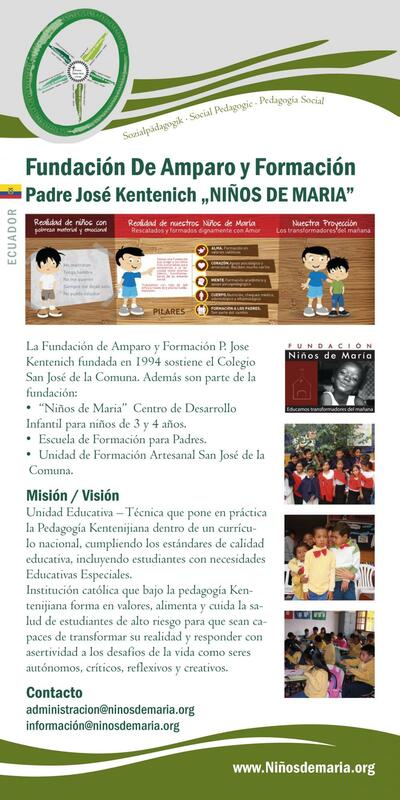 The San José school for children in the first to tenth school year (ages 5-15). The San José institute offers a complete technical training (ages15-20). A school for parents (Christian promotion of the family, systematic family therapy). A kiosk, Tienda de María, open to the whole parish. The Fr Joseph Kentenich Centre to train business people. The order of being determines the order of action. Love is the basic law of the world.